Content marketing is an art and it’s one that Buzzfeed excels at. So how did a site originally devoted to listicles, quizzes and surviving the hours at work become a modern publishing phenomena spanning memes to investigative journalism? By creating great content that resonates with their audience, is quick to read and is multi-channel friendly, thus, easy to share. It’s not unusual for brands to create content without stopping to think about who is using it, why they’re using and how they’re accessing it. Often, they’re more focused on what they’re trying say. Jonah Peretti, the founder of Buzzfeed, takes a very different approach – he constantly encourages content creators to stop and think about just how the audience will utilise the end result. How will it be shared? What will it add to the users’ life? These are questions that we should all be asking ourselves, every single time we produce content, because whether it’s for a blog, a press release or a static web page, it’s all part of content marketing. 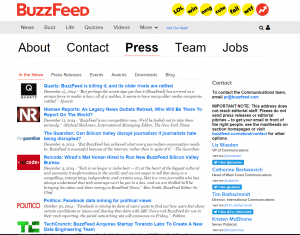 Buzzfeed was created for today’s mobile and social media world; over 70% of users access the site using mobile technology, meaning that not only does any content created for the site need to be mobile friendly, the site itself has to be fully optimised for mobile, a practice that many businesses would be wise to follow. While not every business can expect 70% of their traffic to come from mobile devices, it’s worth noting that Google informs us that approximately 50% of people visiting a site are using their mobile devices to shop or research. This means that if it’s not the case already, then pretty soon, the majority of visitors to your site will be using their mobile device to find out about who you are and why they should use your business. We all know the frustration of trying to find something on a site that isn’t optimised for mobile and if I asked you if you’d ever just given up on a site and gone to a competitor site instead, I know you’ll say yes. How do I know this? Google told me so. Google knows that rather than try to dig for the information they want on an un-optimised site, 61% of visitors will simply back out of a site and move on to a competitor site. 61%! Just stop and think about that. If 30% of your site hits are from users on mobile devices and 61% of those people are turning to a competitor because they can’t find what they want on your un-optimised site, then that means you’re leaking between 15 – 20% of your total potential enquiries! By anyone’s standards, that’s a lot of lost potential. Chances are, you don’t need a dedicated mobile site, you just need to optimise your existing site for mobile users. Once your site is mobile friendly, you need to make sure that the content you’re posting is also able to be easily used and seen by mobile users. Brand Guidelines. Does this content reflect who you are as a company? Is it in keeping with your values? Does it ‘fit’? Integrity. Not surprisingly, ensuring that your content is factually correct is pretty key. Part of building your brand is ensuring that your users know that the information you provide, and therefore you, is trustworthy. Consider Your Channel. Are you hosting this content on your website? Utilising a particular social media network? Where the information is going is almost as important as the information itself and certainly plays a large role in determining the format you’re going to use. Format. Are you creating an article or quiz? What about video? Which format best suits the content you’re going to produce? Will people be most likely to view it on a desktop or a mobile device? What is going to add the most value, for example, if you want to show static data or screen shots, an article may suffice, however, if you want to show dynamic data, a video may be more suitable. Promotion of Your Content. Now you’ve established which channel/s you’re using, you need to decide if you want to promote it organically and/or pay for promotion. Metrics. How do you know if your content strategy is working? How will you determine which content is more ‘successful’? Success is about more than page views or average viewing time, consider things like the number of shares, likes and comments. Or does the content end up being shared over multiple media channels? While these aren’t the only steps you can include in your content marketing creation process, we’d say they should certainly form the basis of any process you develop. After all, BuzzFeed thinks they’re important enough to include in theirs and if it’s good enough for the 125th most visited website in the world, which – by using these steps – is now worth around $1B USD, then chances are it’s good enough for you. I know, you’re probably thinking that that would be fairly obvious but honestly, it needs to be said. It’s actually surprising how often content developed for the internet doesn’t quite hit the mark. Think about BuzzFeed – they know that 70% of their visitors use mobile devices, so do you really think that it’s coincidental that they almost singlehandedly drove the rise and rise of online listicles, which are easily navigated and browsed on mobile devices? The other thing that BuzzFeed do is tap into people’s emotions – content that makes people laugh, cry or think is content that creates a sense of connection and that is the content that gets shared. BuzzFeed is a goldmine of information, through them, we can identify trends and new opportunities, then use these valuable insights to adapt and optimise our own campaigns across multiple channels. BuzzFeed isn’t the only company we can learn from, look at companies within your own industry as well as larger organisations and learn from their experience. What we learn from BuzzFeed is to experiment, measure the results of the experiment, apply the learnings, adapt to the new information and implement it across the board (or to the appropriate media channels). It’s almost scientific but by adopting this process, you, like BuzzFeed, can make more effective content with a bigger impact, growing your audience – and your business – through effective content marketing. You need your site to be mobile responsive. Google is rewarding sites that are and penalising those that aren’t. You know which side of that equation you want to be on. Develop a content creation process. Don’t just sit down and create ‘stuff’ – think about what you need to create and the 5 ‘W’s’ – Who, What, Where, When, Why. Your grade 8 English teacher will be proud. Don’t forget you’re creating for the internet! Measure the impact of the content. Apply the learnings. Adapt your process to the new insights. Repeat the cycle. And as always, if you have any questions about content marketing, or if you would like us to deal with this stuff for you, why not contact us today?